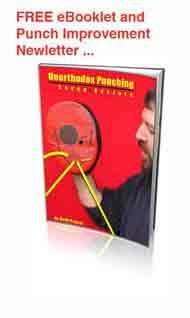 Analyze Your ‘Block’ … Even If You Punch First! As long as you are willing to keep an open mind, let’s analyze your forearm block. This time, we’ll deal with blocking a punch, rather than a swing of a weapon. If you are subscriber to Martial Arts Mastery, then you know that I favor a response of hitting before I respond with a check. There is no use belaboring that point, right? Would you like to know why I say ‘check,’ instead of block? It has to do with possible follow-ups to the block. Let’s say your opponent punches at your midsection with a reverse punch with the right hand. Let’s also say that your left foot and hand are ‘slightly’ forward. Depending on the position of your forward hand (left) when your opponent punches will determine if you will block inside to outside or outside to inside. First, your hand is lower. Your opponent punches. So, you respond with an inside to outside block. You push the inside of his arm toward the outside. Possible problems? The punch could be a fake. You were just suckered. Or the punch could be real. In which case, you just opened up an inside line. Let’s take the other option. Your lead hand is in front of your face when the opponent start the punch. This time, you react with an outside to inside punch. You hit his arm on the outside, pushing it across your centerline of your body (and more importantly, across his or her centerline). You have just set your self up for similar falls: The initial punch could be a fake. Again, you were suckered. Or … you have just opened up the line above your elbow, between your forearm and your biceps. You are damned if you do, and damned if you don’t, right? If you outside block, you either get faked or you open a new line. If you inside block, it’s the same. Warning: This may mean you have to step slightly off-line to make the tactic functional. And you may have to learn the precise definition of center-line theory. So, have I given you something to think about? You aren’t blocking. You don’t send the punch arm flying with the force of your block. Such force gives someone within developed energy the exact feeling needed to redirect back on line. Instead of a block, it’s a check. It’s a stopping of energy — it’s a control (while my other hand and my feet are bashing away). How would your martial arts change if you never sent your energy off sideways by blocking outside or inside, but rather you learned to stop any future follow-up with the attacking hand, because you are checking to the center?